Awkward note: My nails grow out really fast; I took this photo 4-5 days after actually doing it, so the gap between the polish and my cuticles is rather large :x On the plus side, now you know that L'Oreal Colour Riche holds up well without chipping! I ordered the MASH 2012 nail stamping set (inexplicably no longer listed on Amazon, but is available on eBay) back in December but I haven’t actually tried any of the plates until now. The design smudged a bit on my ring finger after applying Seche Vite top coat but I’m rather happy with how it turned out. It has a home decor vibe to it; I want a pillow or something in this print, haha. I would definitely stamp this again on top of a green or blue for a fresh spring look. Violet Vixen is a very red-leaning violet or berry. The brush on this polish takes some getting used to: it’s not as dense as other nail polish brushes → doesn’t hold a lot of polish in the brush → wiping the brush against the bottle sides tends to be an unnecessary step. 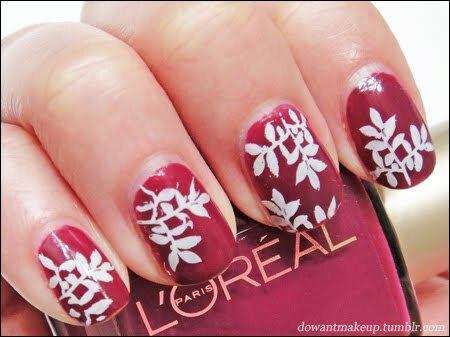 I tried using Sinful Colors Snow Me White on my right hand (shown) for stamping this time rather than Konad White. The Konad White Special Polish results in a brighter, bolder white, but I think the thick, goopiness of it makes it more prone to smudging when applying your top coat. I don’t think it is a huge difference unless you’re comparing the two side-by-side, so the Sinful Colors works pretty well if you don’t want to get the Konad White.